Want to learn how to cook butternut squash without a lot of mess? With my Roasted Butternut Squash Recipe, there is no more peeling and cubing – it’s easy peasy! If you are on the GAPS diet, Paleo, Whole30 or just love to real food that is healthy, you need this recipe! Be sure to watch the video to see how easy it is and also get your free printable. The most common complaint with butternut squash is how very hard and slippery to cut it is. But, with my Roasted Butternut Squash Recipe, that is no longer a problem. I learn best by watching someone else. 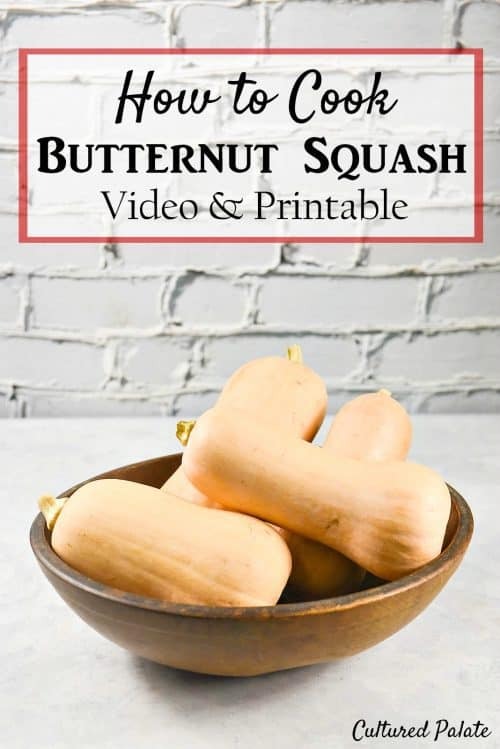 So, watch the video and see for yourself just how easy it is to roast butternut squash and enjoy this flavorful veggie! I love knowing what other people use and why they like particular products. Here is a list of resources that you see me use in the video and why I like it. Most of the links will take you to Amazon. Knives – I have been using these for quite awhile now and they are staying sharp even with all my usage. Cutting Board – A good cutting board is especially necessary with butternut squash to protect your counter surface. Pryex Baking Dish – I use this for many different purposes from microwaving leftovers, to baking to marinating meat. A bonus is the plastic lid that comes with it. Polish Pottery – I bought most of my Polish Pottery when we lived in Switzerland. Now, if a piece breaks or I if I just want something new, I check eBay. Roasted Butternut Squash is delicious when eaten alone, or used in Butternut Squash Pancakes. 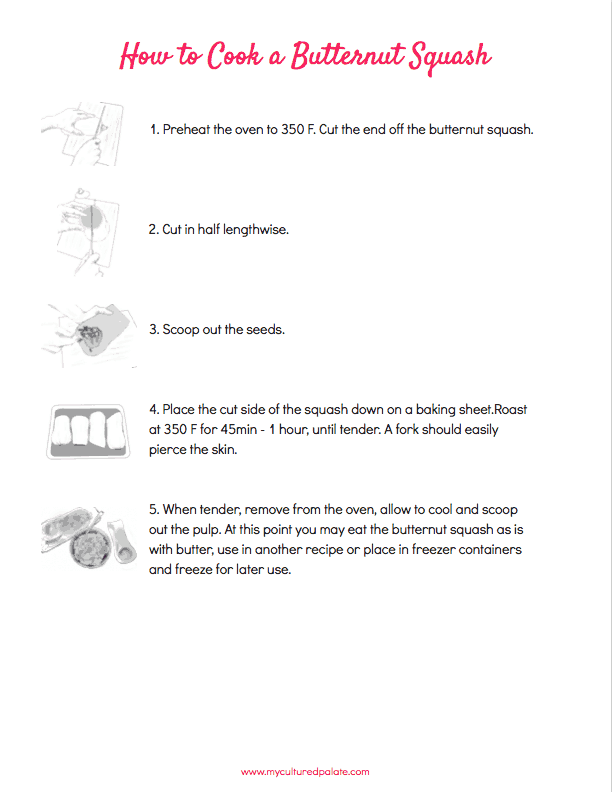 Here is a FREE printable so you have the steps for Roasted Butternut Squash Recipe at your fingertips. 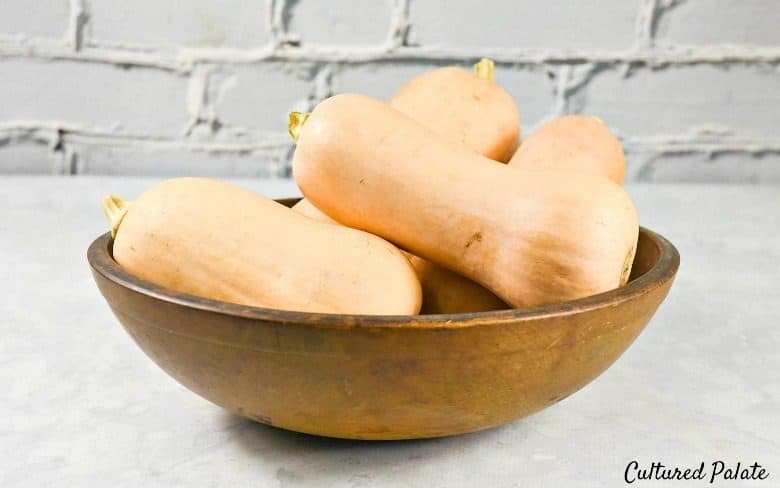 Learn how with my printable How to Cook Butternut Squash. Butternut squash is a winter squash like pumpkin. Growing on a vine, it has a sweet and nutty flavor with yellow skin and orange pulp. When ripe, the skin turns golden and the pulp becomes a richer orange color, getting sweeter as it ripens. Butternut squash is so versatile – roast, bake, boil or puree it. You can use it in casseroles, muffins, loaves of bread and soups. Often, it can even be a substitute for sweet potatoes! Do you need a reason to eat butternut squash – besides it just tastes good? Here are 7! A great source of vitamins A, C and E, magnesium, and potassium. Supports the Immune System – Since it is a good source of vitamin A, C, and Beta-carotene, it helps support the immune system and keep you healthy. Good for Digestion – High in fiber, butternut squash helps prevent constipation and helps maintain a healthy digestive tract. Helps Prevent High Blood Pressure – It is high in potassium which balances and counteracts the sodium in your diet. Helps Keeps Bones Strong – Thanks to the high mineral content – manganese (it contains about 17 percent of your RDA of manganese), iron, folate, and zinc – it helps keep your bones strong. The vitamin C helps in the production of collagen and this is also important for building bone mass. These important minerals along with the vitamin C, all contribute to bone health and protect against osteoporosis. Decreases Inflammation – Because of it high antioxidant content, it may have ant-inflammatory effects to help decrease symptoms of inflammatory related diseases like rheumatoid arthritis. If you have not tried this vegetable, I hope I have convinced you to give it a try! It’s so versatile, but unfortunately, I think often it is dismissed because it has “squash” in the title. It’s a great way to get your vitamins! There are several ways to prepare the squash. Using a potato peeler, you can peel it, scoop out the seeds and cube it. Then, boil or roast the cubes. At this point, you can serve it as is with a bit of honey (if desired) or use it in another recipe. Another method of preparation – and my favorite – is the Roasted Butternut Squash Recipe that I am sharing today. Roasting seems to bring out the richer flavors. In my opinion, it is actually the easier than peeling the squash – and I am all for easy! 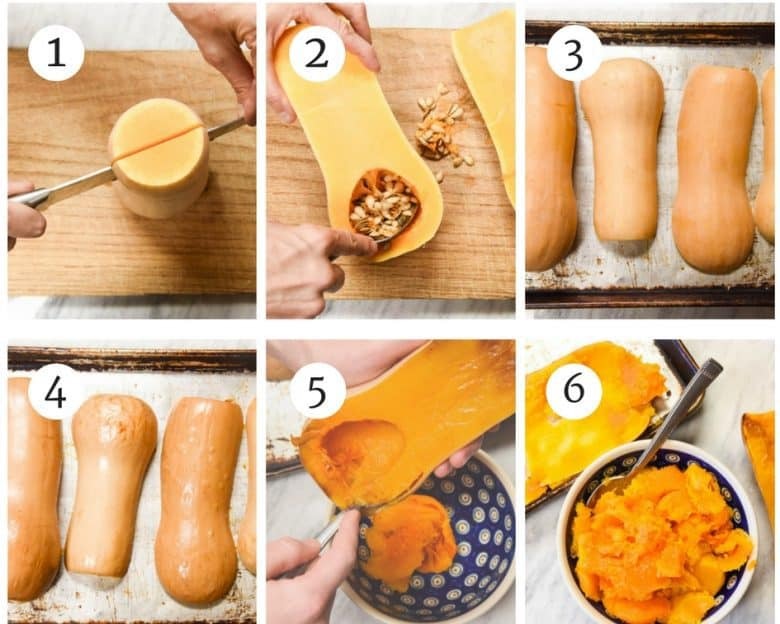 Cut the butternut squash in half. Scoop out the seeds – they can be salted and toasted in the oven for a snack. Next, place the cut side of the squash down on a baking sheet. Place in the preheated oven (350 F) and roast for 45min – 1 hour, until tender. A fork should easily pierce the skin. When tender, remove from the oven, allow to cool and scoop out the pulp. At this point you may eat the butternut squash as is with butter, use in another recipe or place in freezer containers and freeze for later use. Tip: Have a sharp knife to cut butternut squash with because they are very hard and hold firmly with your hand and fingers out of the way because once cut, they are slippery. 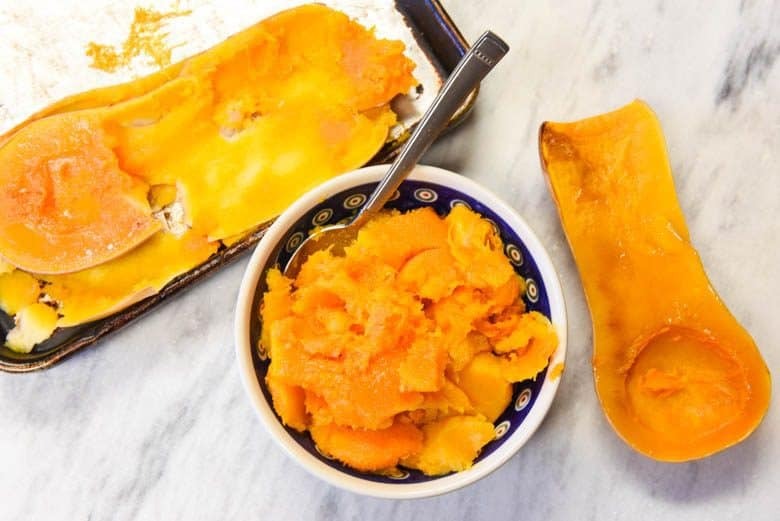 If you’ve tried this Roasted Butternut Squash Recipe or any other recipe on Cultured Palate please take a minute to rate the recipe and leave a comment letting me know how you liked it. I love hearing from you! You can also FOLLOW ME on PINTEREST, FACEBOOK, INSTAGRAM, YouTube and TWITTER. Roasting any vegetable brings out the sweetness. Scoop out the seeds - save for toasting. Place butternut squash cut side down on cookie sheet or baking dish. Cook 45 mins - 1 hour until tender. A fork should easily pierce the skin. Use as desired. See Butternut Squash Pancakes or mix with butter and/or honey and serve. As many butternut squash as you wish may be placed on the cookie sheet for roasting. What’s your favorite butternut squash recipe? Are you eating it for any nutritional benefits? Feel free to share in the comments! Thank you for this. Butternut squash showed up in my CSA bag this week and I’ve just been looking at it ever since thinking “huh”. I’m gonna head out to the farmer’s market tomorrow and get a bunch to roast and freeze at once. Thanks again – looks delish and easy. I use a lot of Butternut’s this time of the year because they are so abundant in our garden. We just love them roasted it is really delicious. Hope you are having a great weekend and thanks for sharing with Full Plate Thursday. Thanks for the great tips. (I have tons of this in my garden. Can’t wait to try this.) 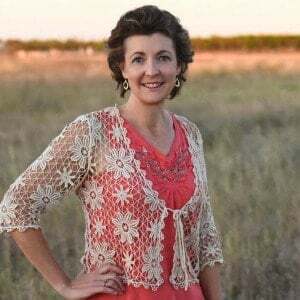 I would love it if you visited my new Gluten-Free Monday party at OneCreativeMommy.com and linked up this and any other idea you would like to share. I hope to see you there. I LOVE butternut squash but I always find it so unmanageable. This is such a great way to work with it. Now if only I can remember to use this next time I need some! We just had this with dinner tonight and it was SO YUM! I didn’t even think about baking up a whole bunch at once though and freezing it off. I know what I’ll be doing this weekend! Love roasted squash! Never even occurred to me that you could use a potato peeler and peel it! lol Or that the seeds could be eaten like pumpkin seeds — will definitely have to try that. Thanks for linking on Busy Monday!